Culms: Erect, long, slender, soft to rigid, often flattened, sometimes twisted, glabrous. Leaves: Few, small bladeless sheaths near bases of culms, pale brown, tips appear cut nearly straight across. 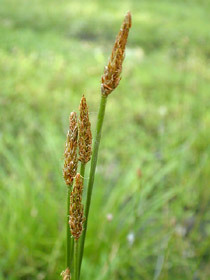 Inflorescences: Spikelets, solitary, terminal, lanceolate to slightly cylindric, to 1.25 inch long, few- to many-flowered; flowers perfect; lowest scales usually 2, sterile; fertile scales spirally overlapping, narrowly ovate or oblong-lanceolate, pale brown to straw colored with light green midribs; margins transparent; tips blunt or pointed; bristles to 8 at bases of flowers, as long as achenes or occasionally very short; styles 2-cleft, enlarged below into small, cap-like projection. Fruits: Achenes, egg-shaped, yellowish brown, becoming dark brown with age, 1-seeded. Habitat: Pond and lake edges, marshy areas, and ditches. Flat-stem or compressed spike-rush (Eleocharis compressa) occurs in similar habitats but is only 4-12 inches tall.